This outfit is as simple as a walk in the park, literally! 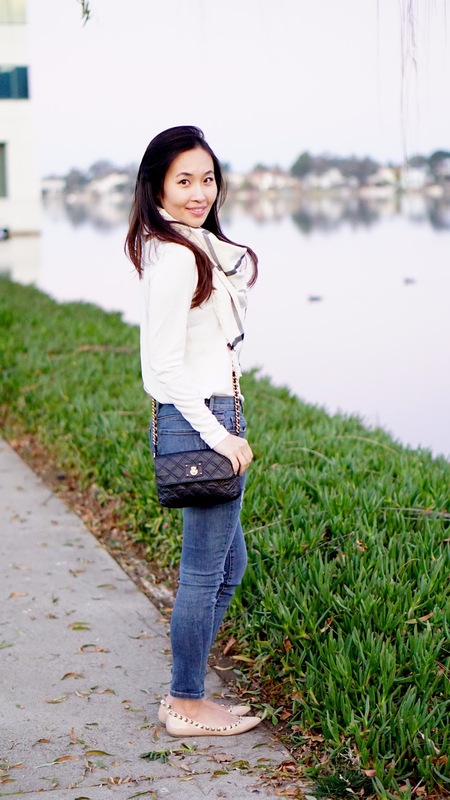 A white shirt, scarf and distressed cropped jeans. As some of you may know, I'm a classy girl at heart. The whites, beiges, black and neutral toned colors will always be my go-to no matter what the season. On another note, I'm so excited for my trip to Taiwan and Japan! I'm looking forward to the food, the sights, and the culture of these two beautiful countries. I read some reviews on the Steve Madden studded flats saying that they can be uncomfortable to walk in, so I was a little worried when I first got them. However, they worked out great for me! Some people mentioned it scratched their feet, but for me it's one of the most comfortable flats I own. It has a slight padding, so while it's not suitable for long hours of walking, it's great for a day of shopping or some light walking outdoors. The material is pretty durable, so its not flimsy and doesn't feel cheap. I've been eyeing on the Valentino flats for a while but not wanting to break the bank, this is great alternative. Really love this simple and chic outfit, especially the scarf :) It's so lovely! And really? I've been on the look out for a great pair of flats (my Tory Burch ones are pretty, but they scratch my feet so much), so definitely appreciate the recommendation <3 Have a Merry Christmas, love! I like the simple outfit! Felicia! I'm so glad you stopped by. It's been so long! How are you? I've shared this blog once on facebook, but I don't think many people know about it yet. I have many updates to do, please stop by again :) btw, we should catch up someday!